** Auction #7, Round 2** A jaw dropping example of arguably the most important modern era trading card in the world. Offered here is a true stunner, not just a PSA 10, but an example excluding quality which according to our statistics places it in the top 15% of all PSA 10s worldwide. A glistening Jordan RC, boasting 50/50 framing, flawless edges, and four immaculate corners. Wonderfully printed both reserve and obverse; even the back is well centered. We have scoured every speck of this gem, looking for flaws and come up virtually empty. Just about the only thing we reference as a source of imperfection is an almost imperceptible print dot in the blue name band to the immediate upper left of the letter "B" in bulls. It's this one trivial flaw which kept this card to the PQ designation and not the HE designation (which corresponds to the top 5% of all examples). 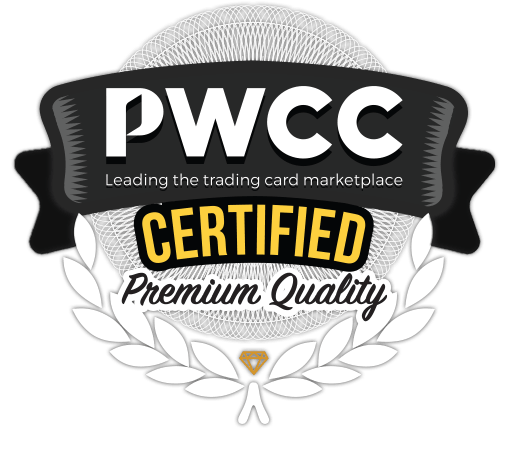 Compared to the broader world of GEM MINT Jordan RCs, this card reign supreme and represents an investment opportunity far superior to the typical elite example. This comes with our highest recommendation. One of over 15,000 cards, lots and sets up for bid in our 7th Auction of 2018. Click on the link above to view the other PWCC auction lots.